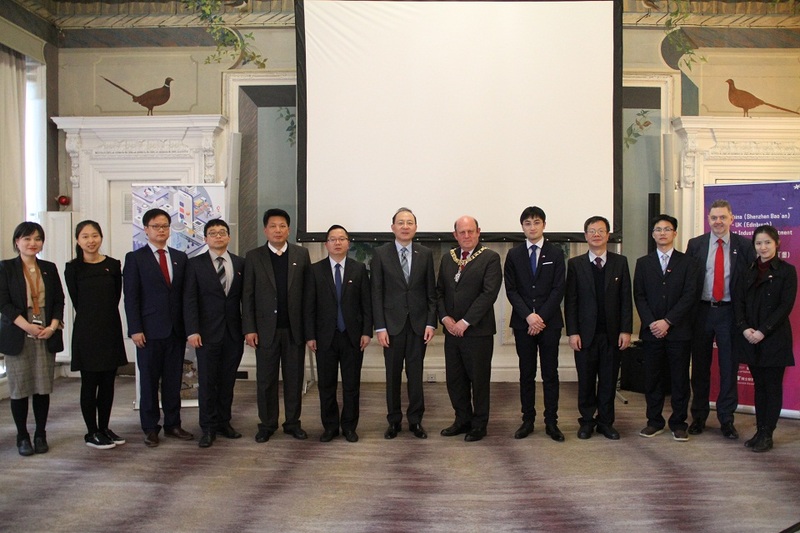 On March 27, 2019, the Shenzhen Bao'an-Edinburgh Intelligent Industries Investment & Cooperation Seminar was held in Edinburgh. Consul General Pan Xinchun, Lord Provost Frank Ross, Deputy Director of Invest Bao'an Shenzhen, Mr. Zheng Feiyan addressed the event. Consul General Pan welcomed the Bao'an delegation. He noted that Edinburgh and Shenzhen enjoy flourishing relationship and increasingly close high-level exchanges. The Edinburgh-Shenzhen Creative Exchange has nurtured collaborations in many fields. Bao'an District is a economically developed region with favorable investment environment, and shares the same value in intelligent industries with Edinburgh. Consul General expected this event to inject new impetus into Shenzhen-Edinburgh cooperation. Lord Provost Frank Ross spoke highly of the friendship and cooperation between the two cities. He will visit Shenzhen for the second time this May to help deliver more substantial and concrete outcomes in collaborations on education, health and creative industry. He congratulated Edinburgh-based Adabotics for successfully settling in Bao'an. Mr. Zheng Feiyan appreciated the support by Chinese Consulate General and Edinburgh City Council. He presented the fruitful trade and investment cooperation between Bao'an and the UK, expressing that the Outline Development Plan for the Guangdong-Hong Kong-Macao Greater Bay Area released this February will deepen regional opening-up, and favorable investment environment, strict IP protection as well as the well-developed logistics system in Bao'an bring more opportunities for future investment.